Living in the Cotswolds myself, I rarely stay at hotels at home so I have sought advice from friends who have. One of their favourite places to stay is Barnsley House, a Grade 2 listed house, built in 1697, near Cirencester. Last year I attended a dinner party at Barnsley House where we all sat sipping G&T's on the hotel's fabulous terrace overlooking the gardens. The contemporary décor blends with the traditional features of stone fireplaces, wooden beams and floors to preserve the character of the building. I am told that the rooms are spacious and comfortable and the Spa is second to none. One day I might make my way to spend a few nights at the hotel for 'research' purposes naturally! To ensure a chic arrival at your weekend retreat, be sure to pack everything in one of Tusting's leather holdalls. On Monday this week I presented classic pieces for a country wardrobe. 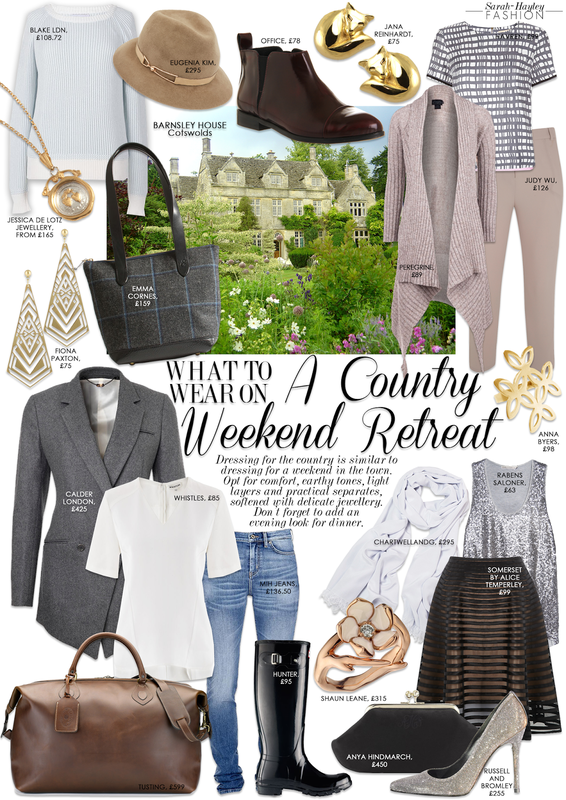 Today I feature my favourite items fit for a weekend country wardrobe. Dressing for a weekend away is similar wherever you are. The idea that in the country everyone is kitted out, head to toe in tweed is a myth. Whilst we adopt certain areas of tweed into our style, for example a tailored jacket or a bouclé coat, a true country girl wouldn't go overboard. Keep in mind you are dressing practically for a weekend where you will be walking, shopping, lunching and relaxing. Ensure your wardrobe contains the basics. I have chosen, jeans by MiH, a crepe top by Whistles and Calder London's tailored jacket. Always remember to pack something for the evening. Sparkle never goes out of style so I have opted for this silver sequinned sleeveless top by Rabens Saloner at Foundation, teamed with this ribbon mesh skirt from Somerset by Alice Temperley at John Lewis. For afternoon relaxation choose light layers. I love this painterly top by Havren teamed with Judy Wu's Cropped Trousers and this sumptuous knit by Peregrine. Keep boots flat, Hunter's wet-look boots are a glamorous alternative and I love these Chelsea Boots by Office for shopping days. Keep the jewellery minimal but statement. I wear my Jessica de Lotz wax seal necklace everyday, it is light to wear and just the right size to be noticed. Jana Reinhardt's sleepy fox earrings, nod to the countryside and with their whimsical charm they are irresistible. I adore all of Shaun Leane's jewellery but especially this cherry blossom ring. It's thoroughly delicate and feminine and in-keeping with the nature theme. If you are heading to the Cotswolds or countryside this Summer tweet me a photo of your #countrystyle look and I shall add it onto Pinterest to inspire others.